Home, Office or Business Services! Restaurant Pro Express point of sale system is packed with the most desired features for a restaurant. You may click on the pictures below to show the full screen shot. Servers may login into the POS with a secure login card or with their user name and password. If the server isn’t yet clocked in for the day, Restaurant Pro Express will clock them in. 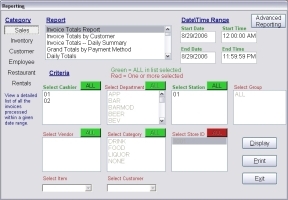 The manager button on the top of the screen can be used to access back office functions such as reporting and menu management. The picture and colors of this screen can be modified to match the style of your restaurant. 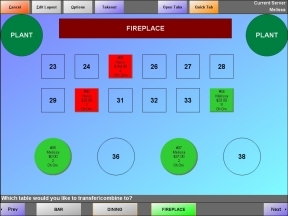 Only used in table service restaurants, the table diagram screen prompts the server to select which table they are modifying. The different dining rooms are displayed on the bottom of the screen. RPE allows an unlimited number of dining rooms, each of which can have tables and other landmarks in the restaurant. 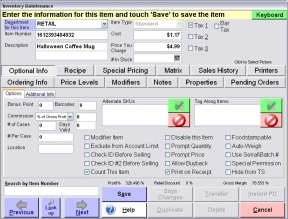 This screen can be turned off in the POS for quick service restaurants. A server or bartender can also start a tab for guests just at the bar for drinks, or spending time at the bar while waiting for their table. Tabs are listed by name in alphabetical order and can be closed out at the bar or transferred to a table. 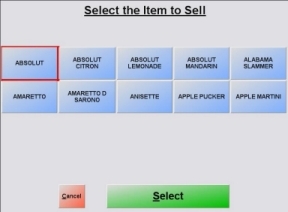 A bartender can also use the Quick Tab button for guests who are ordering one drink and paying for it immediately. 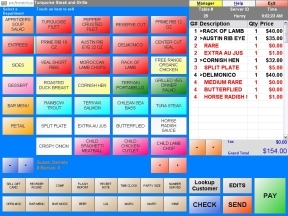 As with tables, tabs can be accessed from any restaurant POS station. The menu screen is a simple screen where the server enters the order. Departments are listed down the left side and the items within that department are on the right. Menu buttons can be configured with colors and pictures. Colors are often used to categorize like items for faster checkout. 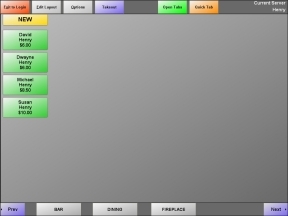 The sixteen items on the bottom of the restaurant POS screen provide one touch access to configure commonly used functions or best sellers. After a menu item is selected, RPE will prompt the server to select the modifiers for that item. The server is walked through the selections one at a time, leaving no room for error. Checks can be split evenly any number of ways for guests that want their own bill. If using the ‘Order by Guest’ feature which allows you to assign each item to a specific guest, the server can also split each guests items onto their own check with the touch of a button. If you need even more flexible check splitting, you can touch individual items and move them to their own check. 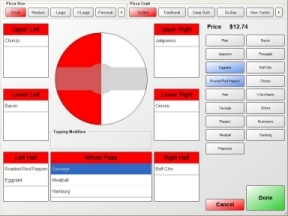 RPE features an industry leading Pizza Ordering Screen which streamlines the ordering process by minimizing the number of touches required to order a pizza with various toppings, sizes and crusts. Toppings can be added to halves, quarters or the whole pie by selecting the region and touching the toppings to go on that region. Crusts and sizes and be changed with the touch of a button. Managers may wish to comp an item for a VIP customer, or void an incorrectly ordered item. Bartenders often buyback an item for a regular customer. Comps, buybacks and voids are permission based exceptions that require a reason code to be selected. All exceptions are listed on the Operational Exceptions report with the server ID, date\time and reason code. A party can be transferred from one table to another by using the Transfer Table function. To do this, simply touch the Transfer button and select the new table to transfer to. You have the option to transfer to an occupied table and combine the checks. Managers can also transfer checks from one server to another in the event that a worker has to leave the restaurant. Checks can be transferred from any restaurant POS terminal. 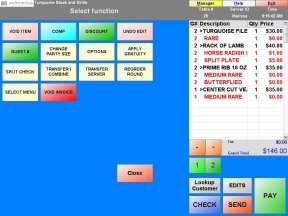 Each POS terminal may have its own unique menu configuration. Bar menus are often alphabetized with hot keys to jump between liquors. After entering all of your menu items, RPE has a button to automatically alphabetize them for your convenience. Items can be modified or deleted off of a ticket by touching the item and touching the desired function. Multiple items can be selected at the same time so your servers don’t have to perform the same operation more than once. Items can only be deleted off of a ticket if they haven’t yet been sent to the kitchen. Otherwise manager permission is required. The Reorder Round function is a quick way to reorder several drinks without having to manually reenter them. 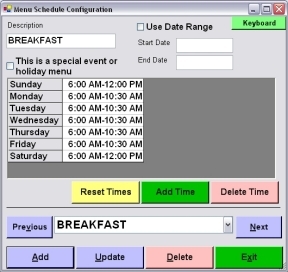 The multiple menu functionality can also be used for holiday menus. For example, a Valentines Day menu can be planned and programmed in advance for February 14th; the menu will automatically turn on and off at the correct times. To select a customer for the transaction, either swipe their loyalty card or search for them by name, phone number or company name in the customer search screen. The point of sale terminal has built-in customer loyalty functionality that includes point rewards, birthday bonuses, frequent visitor discounts and other flexible options. Loyalty rewards plans are a proven way to generate repeat business. Each check can be closed out to one or more tender types, including cash and credit card, two or more credit cards, or through any combination of payments. The payment screen includes optional quick pay buttons that are useful to enter cash amount in bars and quick service restaurants. Credit cards can be processed over the internet in as little as 2-3 seconds. It is not necessary to touch the credit card button – simply swipe and it will process. 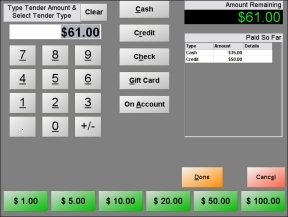 Restaurant Pro Express includes several other POS functions that are not used for every transaction. 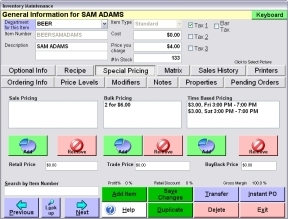 The Edits button shows a list of other useful functions including changes in party size, quick ways to reorder a round of drinks and an advanced discount interface. If configured to allow this, manager can also re-open paid tickets in the instance they were accidentally closed. 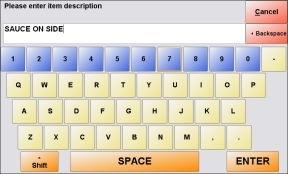 An on-screen keyboard is available if a guest has a special request that does not have a menu item associated to it. A numeric keypad will pop-up on the occasion where dollar amounts are prompted. Gift cards can be sold and redeemed through the POS with no transaction fees. 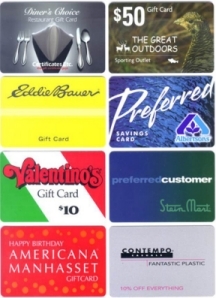 Your restaurant can purchase gift cards that are customized with your logo. Gift card data is available at one location, or between multiple corporate locations, in real-time with no transaction fees. If a multi-site franchisor organization wishes to issue gift cards where multiple franchisees may claim the redemption, we recommend you use a processor-based gift card system. At the end of shift, many restaurants require bartenders and cashiers to count their drawer. 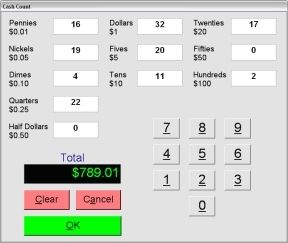 The Cash Count screen is an easy way for cashiers to count their money, allowing them to move fast so they can end their shift and go home. Restaurant Pro Express uses blind balancing which is known to enforce honesty when handling cash. The POS can automatically prompt for a recount if the counted amount is different from the expected amount. 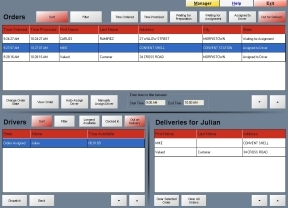 Restaurants that deliver will use the delivery tracking screen to assign orders to drivers. Employees can see the status of each delivery order including what is waiting to be delivered, which orders dispatched and what the promised time of delivery is. Drivers check-in and close out the orders when they return from their delivery. 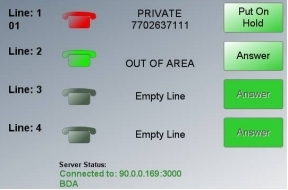 Also useful for delivery restaurants, the caller ID interface alerts order takers to who is calling, whether or not they have ordered before and if so what their past order was. For repeat customers, the POS automatically starts a new ticket populated with their name, address and optionally a repeat of their last order. Use of the caller ID interface requires the purchase of a separate caller ID hardware device that is available form pcAmerica. Happy hour and other special pricing can be pre-configured in the menu creation screen. There are several different pricing options including VIP and employee pricing, bulk pricing (1 beer for $ 4, 2 for $ 6), and happy hour discounts. Special pricing is a secure function that can only be accessed by designated employees. Price changes can be made for the entire restaurant from any restaurant POS terminal so the manager doesn’t have to leave the floor. If your restaurant sells t-shirts, mugs or other retail products, they can be rung up from any POS terminal by using a button for the item on the menu or scanning the bar code on the item. 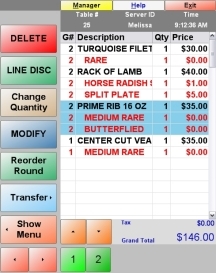 Items are configured within Restaurant Pro Express in the same interface that menu items are created – the main difference in process is the UPC number would be assigned as the item number. 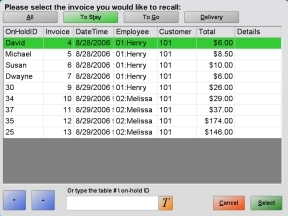 Nearly any action performed at the restaurant POS terminals can be recorded and reported on within the Reporting screen. Restaurant Pro Express includes 75 reports, most of which can be run between a date range with several pieces of selectable criteria. 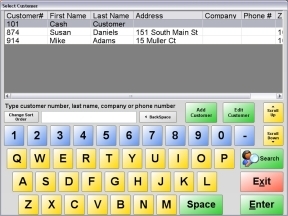 Reports can be viewed on the screen, printed, and on most occasions exported to Microsoft Excel.